Amy Lim from Singapore is our latest Project Sanctuary Master. She is also a Vajayana and Shamanic Practitioner, certified EMO, Animal Energy Healer and Animal Communicator. In her interview, she describes how much she resonated especially with the spirit work of Soul Piloting, and the Past Life regression, as reincarnation is a very important part of the spiritual life in Singapore. 1. Tell us about Amy Lim - who is she? 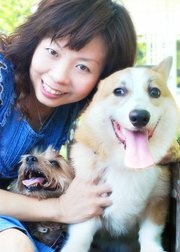 Amy Lim is a Vajayana and Shamanic Practitioner, certified EMO, Animal Energy Healer and Animal Communicator. She incorporates New Age way of alternative healing in her healing practice which is a mix of eastern and western philosophy. Since young, Amy takes a strong interest in the occult and metaphysical realities beyond the normal realm; she loves animals and enjoys talking to reality and imaginary animals. She is a gifted healed at very young age as she has the natural sensitivity to understanding other’s pain. Many friends and adults will seek her compassionate attention and walk away feeling uplifting and healed in certain way. Amy’s heart & soul is on the wellness of people, animals and Mother Nature. She is competent and enjoy guiding others, whether physical or internal terrain. She is adventurous and enjoys travelling to others land or her inner dimensions which Project Sanctuary course suit her well. 2. Why did you decide to enrol on the Project Sanctuary Masters Course? As an Animal Communicator, my usual style of work is connecting a animal in Sanctuary than talk to them. One day my energy mind guides me to look at Dragon Rising Web site; a free download on 1st Sanctuary Meditation.mp3 by Dr Hartmann caught my eyes. I downloaded and tried on the exercise and had a wonderful experience in the Sanctuary. I developed a strong urge to learn more and believe it can benefit my healing work. Beside that, I have gained a lot of new insights from my previous course Genius Symbol also from Dr Hartmann, so I believe this course will help me even more. 3. How did you find the course and working directly with Dr Hartmann? Project Sanctuary is a very brilliant course and I am so surprised to learn that I can do so many things in Sanctuary. Those Sanctuary techniques have helped me to solve problems, gained new insights and most important it helps to release our emotional burdens or disturbances and improve the qualities of my life. I am able to understand why events took place in my life after learning this course. When we can see a better picture from our energy mind, we will be able to live more freely and peacefully. 4. Name three things you learned that are going to be particularly useful for you. The most wonderful thing in this course is that I can learn how to go into a sanctuary and understand that trust my energy mind and I go into different Habitat. Before I do this course, I often only travel to one habitat but now I can access to different habitats to get thing done. I am most interested in the Soul Piloting in this course. There are many souls or ghosts that are left wondering in this plane because of some unfinished business. I am glad to able to help them to work it out, achieve peace and love again so they can travel to the light. It helps them on their metamorphosis. My deep interest is to help people with pets that passed on. Next, I like the Past Life Regression, where I can access to my past and understand why and how events and challenges have taken place in my present life. It helps me to understand my conscious thinking and habit that have played a part in shaping my present life. It also assists me to work out and improve my relationship with people because I understand why people behave in certain way because of past life relationship. Past Life Regression in Project Sanctuary is unlike other past life therapy is that we can change our memories, this way it help to evolve the relationship or past life events. After the change, we will feel enlighten as we have dropped our emotional burden. Besides learning all those PS technique, I have a better understand of living and death, and those unseen realm. I learn to have total trust in my energy mind and always seek it guidance for my highest good. 5. How is being a Project Sanctuary Master going to help you in the future? I am fortunate to learn the art of Project Sanctuary, I will continue to practice to improve myself and also to help others people, animals and souls to achieve more soul development. I will concentrate more on Soul Piloting and Past Life Regression therapy. 6. What's next for PS Master Amy Lim? I will like to use the knowledge in this course to integrate in my healing and energy works. Besides catering to individual’s therapy needs, I will like to hold workshop and classes so that more people in the east will benefit in this kind of work. 7. Anything else you would like to say (to those who may be thinking about entering into the PS Masters program)? This is a course that will help everyone gain more insights of their life. It will also unleash your creativity and increase your intuition after doing those exercises. Everybody has an energy mind and able to born as a human is great because we can use our energy mind to access more information of the unknown. In this course, you will learn to work with your energy mind and how to make the information come to you in a speedy way. This will help in making right choices; improve relationship and qualities of life. I will recommend this course to everyone that seeks more soul development in life. After I finished this course, I do not envy those that we read from books, movies or history that they can connect to gods and mystical realms and figures because I know now after finished this course everyone can do it too. I also recommend this course to people who love to write or script writers.